This collection of poems, written during the Dust Bowl of the 1930s, provides insight into the hardships of daily life in drought-stricken Kansas. The poets' subjects range from harsh despair created by persistent dust storms to thankful verses about much-needed rain. 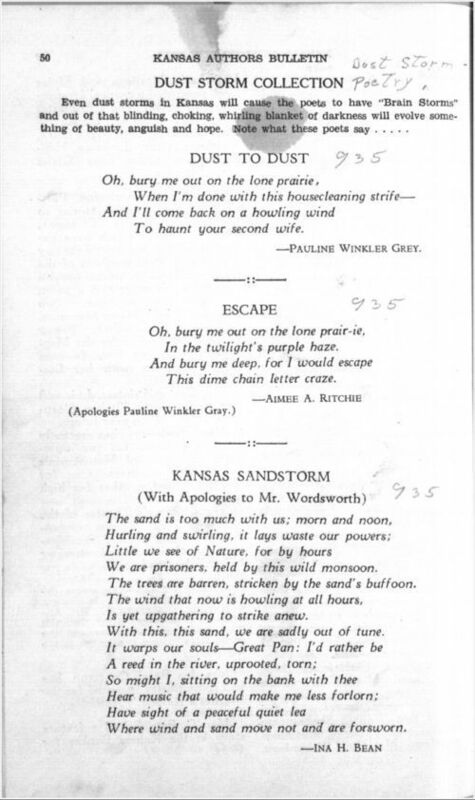 The poems appeared in the Kansas Author's Bulletin. These poems are useful for teaching about the frustration many Kansans felt during the Depression and drought of the 1930s; they are also short enough to be used in a group or individually. This collection could work in tandem with reminiscences and photographs also selected for this standard.